Frank Tanaka was born in Nebraska, near Scottbluffs where the Tanaka family farmed and did cattle ranching on the Wyoming and Nebraska borders. Unlike most of us, he was a cowboy who rounded up the cattle, roped and branded them. After World War II, the Tanaka family moved to Orange,CA. and then finally settled to the SFV in 1952. During his assignment in the Korean War, he made a decision to do service for others. He had initially helped SFVJACC pioneer and president, Tom Ikuta, dig some of the trenches for the water lines. As Post Commander, Frank and the members worked feverishly for many years to installi the flag pole, children’s playground, and all the gardens. Namely, they are the Issei garden, Kiyoshi Muranaga, Congressional Medal of Honor Memorial Vereran’s Garden, and the Kiyoshi Tomiye Garden that was dedicated to remember all the gardeners. Under his leadership, Post 4140 generously raised funds for the second story classrooms in the gymnasium. In addition, Frank found time to install the San Fernando Valley Hongwanji Buddhist Temple Gardens, in later years, he was called to designed the landscaping of the Nikkei Village and Nikkei Senior Gardens. Further, Frank was the founder and leader of the SFVJACC Boy Scout Troop for many years. After more than 50 years of tireless volunteering, he decided it was time for him to enjoy life at a slower pace. Frank loves fishing in Bridgeport, California, and spending time with his life long SFVJACC friends. We honor and respect Frank Tanaka for his many years of selfless service. Thank you, Frank Tanaka, a leader of men and boys. 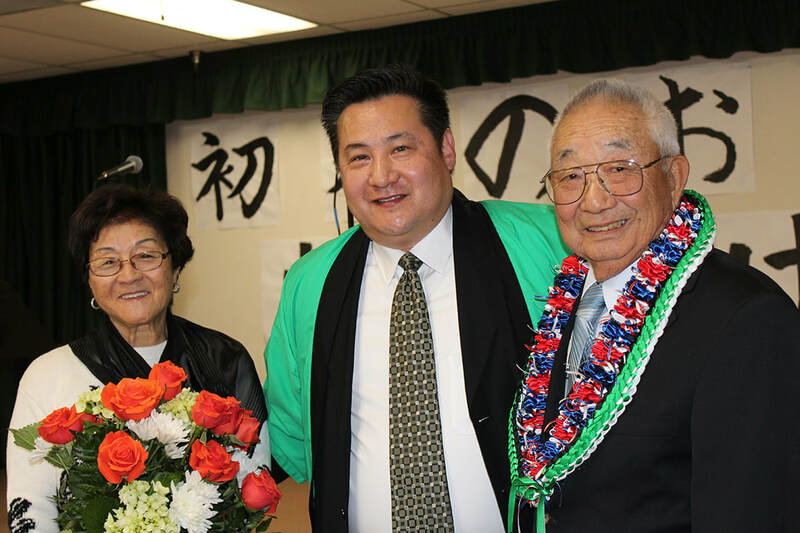 Pictured is Marge, his wife, Danny Okazaki, President, and the Lifetime Achievement Awardee, Mr. Frank Tanaka. Other Lifetime Awardees were Henry Yamamura, Kenji Watanabe, Jack Takeshita, and Mabel Takimoto.